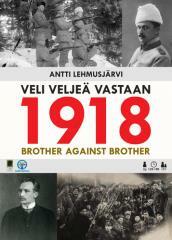 1918 – Brother against Brother is a card driven wargame for two players that takes place during Finnish Civil war. One player is in charge of the senate led White forces while other player tries to led Revolutionary Reds led by People’s Delegation to victory. Game has more than fifty unique cards that depict historical events. Each card has game description as well as short historical text and photograph connected to it. Gameboard has Finnish map from 1918 in it, where towns and roads and railroads connecting them has been marked. The White player tries to win by conquering strategic towns held by the Red player. The Red player tries to win by holding on to towns or by conquering the White player’s capital Vaasa.